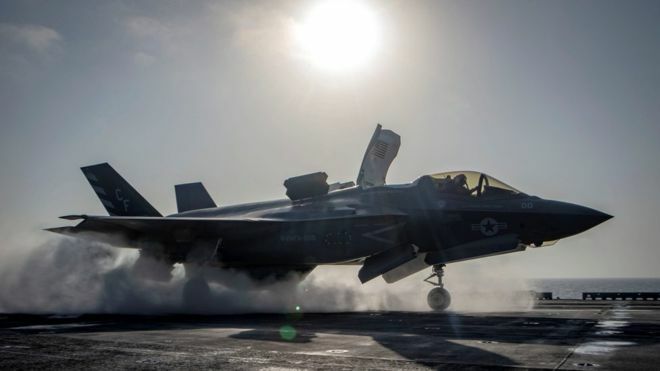 The US military has suffered the first crash in its hugely expensive F-35 fighter jet programme. A F-35B jet came down in South Carolina, the Marine Corps said. The pilot managed to safely eject and there were no injuries. The Marines said in a statement that an investigation into the cause of the crash is underway. Global sales are projected at more that 3,000 aircraft, and the programme is likely to last for some 30 to 40 years. But the programme has been criticised both for cost and combat effectiveness. The jet involved in the incident is believed to have cost around $100m (£77m), although a new Pentagon contract announced on Friday for a record 141 F-35 jets has brought the cost down to around $89.2m per aircraft, according to Reuters. The model is one of three varieties of the F-35 series in operation.